Ranthambore National Park, near the town of Sawai Madhopur, is one of India’s best-known wildlife reserves and is renowned as one of the top places to spot the iconic but endangered Bengal tiger. The park is also one of India’s most popular, but if you can put up with the crowds and the tourist circus, it is well worth it. Ranthambore is known as one of the best parks in India to spot tigers, and although sightings are never guaranteed, you stand as much chance of seeing one here than anywhere else. Besides the tigers, the park also contains a wealth of other species, including Indian leopards, nilgal (blue bull), chital (spotted deer), boar, striped hyena, sloth bears, rhesus macaques and mugger crocodiles. Even without the animals, the park would be worth a visit. The deciduous forest here is one of the last remnants of the once mighty jungles of Central India; the landscape is dotted with crumbling ruins in the process of being swallowed by the creepers, and there are a number of pretty lakes. This is one of India’s most popular national parks and receives 80,000 visitors annually. Most visitors see the park from an open-topped 20-seat ‘canter’ (as these vehicles are known locally); the park is usually very busy, and the animals are used to seeing humans — but at least this makes them easier to spot. 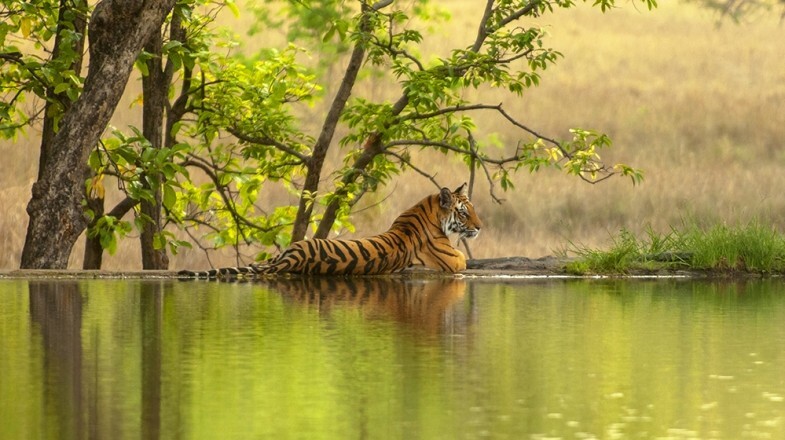 If you want to see a tiger during your time in India, Ranthambore National Park is probably your best bet. Although the population in the park is not large, they are now well accustomed to humans and tend to ignore the busloads of camera-wielding tourists and just go about their business, even in broad daylight. Although you might be forgiven for thinking so, the park is not just about tigers, and you have a very good chance of spotting a variety of other interesting wildlife, including leopards, nilgal, chital, sloth bears and many more. Unsurprisingly, the indifference of the tigers and other animals to people has inevitably led to the park becoming by far one of the country’s most popular. Visits no longer take place in jeeps (except if you are very lucky and are also willing to pay quite a bit more); most people enter the park in a ‘canter’, 20-seat open-topped vehicles that carry the hordes off in search of the park’s most famous residents, often ignoring any other species you might catch sight of on the way. The setting, however, is indisputably exquisite and highly atmospheric, especially in the early morning when the mist rises from the jungle, revealing a landscape that makes you wonder if you haven’t just stepped right into the pages of The Jungle Book. A very good chance of spotting India’s fearsome Bengal tigers. Exceptionally picturesque backdrop to the safari, like something straight out of Kipling’s book. Abundance of other interesting wildlife. Ranthambore Fort, the edifice that gave its name to the park. Very popular and overcrowded — far from a true wilderness experience. Difficult to book a tour in a ‘gypsy’ (six-seater jeep). Since drivers concentrate on tigers, many don’t stop to view other species. Ranthambore Fort, the imposing building that towers over the park and for which the park was named, was constructed in 944 CE. The fort, now a UNESCO-recognised monument, can easily be visited between a morning and afternoon safari — it is accessible on foot from the park’s main entrance. For those hoping for a more close-up and intimate encounter with the park’s flora and fauna, it is possible to organise a jungle walk with a local guide. To book a tour, ask in hotels or tour offices in Sawai Madhopur. The best time to visit is from October to March, which coincides with the dry season. At this time, animals come out from the forest to seek waterholes to drink. The park is open from October to June, but April sees the start of the rainy season, and animals are harder to spot as they stay concealed in the forest. November is considered the very best month for spotting tigers. While it is possible to visit the park in only one day, perhaps taking two safari trips out to look for tigers, staying two or three days will allow you the chance to head into the park more times, maximising your chances of spotting the big cats. There is no accommodation in the park itself, and visitors must stay in the nearby town of Sawai Madhopur. This town is the best place to organise a Ranthambore tiger safari and boasts a full range of accommodation, from the cheapest lodges right up to luxury hotels. The best way to reach Sawai Madhopur is by train; it is easy to arrive there from most major towns in Rajasthan. Trains also run from Delhi and Agra. The nearest airport is at Jaipur, from where it is easy to catch a train on to Sawai Madhopur. It is also possible to arrive by bus from any of the major surrounding towns. The park is divided into 10 zones, but you have the best chance of seeing tigers in zones 1 – 5. However, you have no power over choosing the zones as the booking system is computerized. If you are booking on the spot through the booking office, you have the liberty to ask which zones are available, so that you know your chances. There are only morning and afternoon safaris in Ranthambore National Park. Early morning tours can be surprisingly cold — wear layers so you can remove them as the day warms up. Vehicle options are limited to a gypsy or a canter. Canter safaris are not available in zones 7 – 10. Canter safari costs USD 18* and gypsy safari costs USD 22* per person. The more safari tours you take, the more chances you have of encountering a tiger or two. Despite the crowds that descend upon the park every day, the Ranthambore National Park remains a destination worthy of a visit. The evocative jungle scenery is magnificent and the wildlife plentiful — and here more than practically anywhere else in India, you stand a real chance of catching a glimpse of a wild Bengal tiger, a species that is usually so elusive elsewhere. *Note: Prices are as of November 2018.